We’re celebrating the 70th anniversary of the National Health Service this week – including welcoming anyone who works for the NHS into our store cafes on Thursday to enjoy a free hot drink. Ahead of the big anniversary, some of the community champions from our stores in Northern Ireland met Gareth McGreevy from the Children's Heartbeat Trust to find out more about the NHS charity's work helping children with heart disease and their families. "We're a relatively small charity, and to have such a large retail partner on board is only going to be of great benefit for us and help us spread our message. "It's a great opportunity to tie in our work with the 70th birthday of the NHS, and gets the message out about us and the support service we offer." Representatives from other local NHS charities and hospitals will be joining colleagues in many of our stores to raise awareness and funds for their various causes. 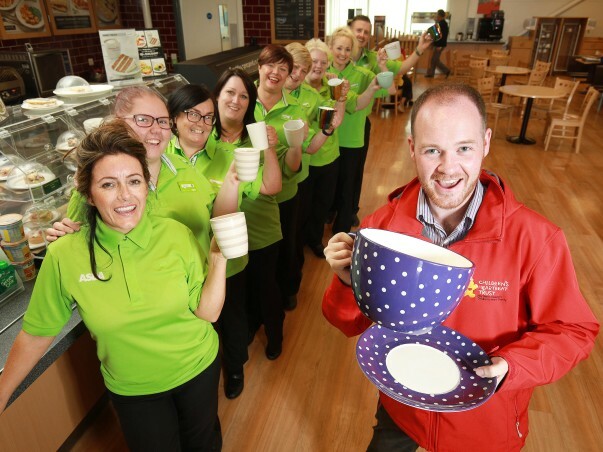 Elaine Livingstone, community champion at our Portadown store, will be hosting one of the 'Big7Tea' afternoon tea events in the store's cafe on 5 July. Elaine, who's pictured here with Gareth, said: "We're so happy to be supporting the NHS. There can't be many colleagues and customers in the store who haven't been helped by the service. "We've got the Mayor coming down to support our event, everyone is really loking forward to it. We're hoping to raise awareness and money while having some nice tea and cake!" 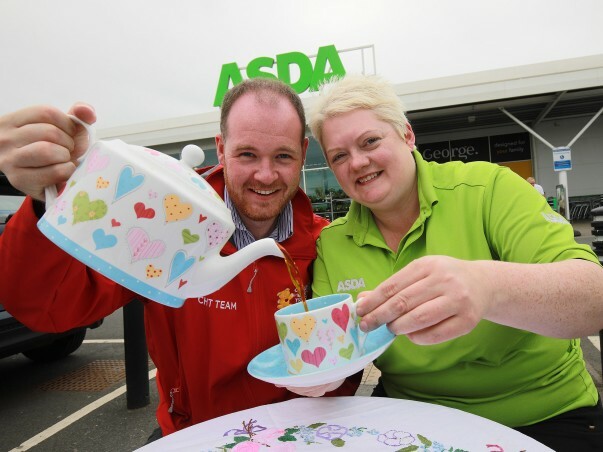 The celebrations are particularly important to our Wheatley store's community champion Angie Young, as she worked as a psychiatric nurse for the NHS for 30 years before joining Asda. Angie presented the team at the South Central Ambulance Service with a cake to mark the NHS's 70th birthday. Angie said: "They were absolutely chuffed to bits that we'd thought of them. There were big smiles all round and they really appreciated it. It felt wonderful to go along and see them and give them a small token of our appreciation for everything they do. "The NHS is the most fantastic resource ever seen, as far as I'm concerned. "The South Central Ambulance Service have been called to our store on a few occasions over the years to come to the aid of customers and colleagues. "It's easy for people to overlook the work that these guys do. When people think of the NHS, they often think about doctors and nurses rather than the ambulance crews, but they're the crucial first point of contact and do an absolutely marvellous job." Angie says some of the skills she learned in her nursing career have been useful in her role as community champion. She said: "Within psychiatry, your main tool is talking to people of any age, from any part of the world, about anything. "So, after 30 years of doing that, I can immediately find something in common to talk to people about. I'm not shy talking to someone I don't know. "Sometimes a simple 'hello' can make such a difference. By just saying 'good morning' and smiling at customers and colleagues in the store, you've made them feel like they've made a friend. "It's the same as when I used to walk round the wards saying 'morning', or 'how are you?' – it transfers over." Angie was 19 when she joined a school of nursing attached to Littlemoor Hospital in Oxford – now Littlemoor Mental Health Centre. She joined Asda 10 years ago. She said: "I completed three years as a student nurse, then I was a staff nurse for many years. When I had a family I went on to night duty, I was a night sister, and then I went back on to the wards as a registered psychiatric nurse. 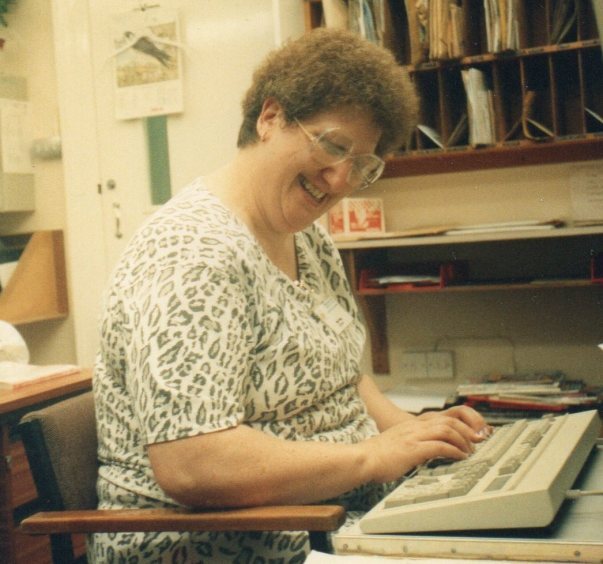 "I was mainly involved in elderly care and dealing with the main types of dementia. "Dementia can change someone's personality. Someone who was very gentle can become very aggressive. That's what I specialised in – reacting and adapting to behaviours, so those behaviours became more manageable." Ross Cornett, head of operations for NHS Oxfordshire, said: "South Central Ambulance Service NHS Foundation Trust is very proud to be part of the NHS, an organisation that has served the whole population of the UK for the past 70 years. "The support and good wishes of the public mean a lot to all NHS staff, and we are very grateful to the staff and customers of Asda for choosing to help us celebrate the 70th birthday of the NHS." If you're an NHS colleague, to claim one free hot drink please show your NHS ID to colleagues in one of our stores which has a cafe on Thursday 5 July. Here are details of participating stores. You can find out more about how the NHS is celebrating its 70th birthday here.